Reply 'For Miss Kerr'. She is to travel to the Isle of Wight for her health, with Mrs Kerr (presumably her mother). He gives advice for the journey and on diet and exercise once there. 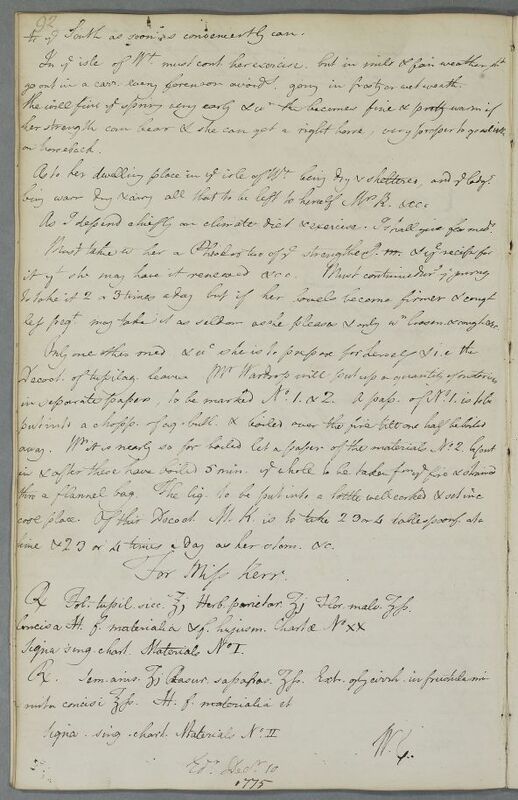 He includes recipes for medicines to take with her: Mr Wardrop will make the materials for her to take with her. Summary Reply 'For Miss Kerr'. She is to travel to the Isle of Wight for her health, with Mrs Kerr (presumably her mother). He gives advice for the journey and on diet and exercise once there. He includes recipes for medicines to take with her: Mr Wardrop will make the materials for her to take with her. 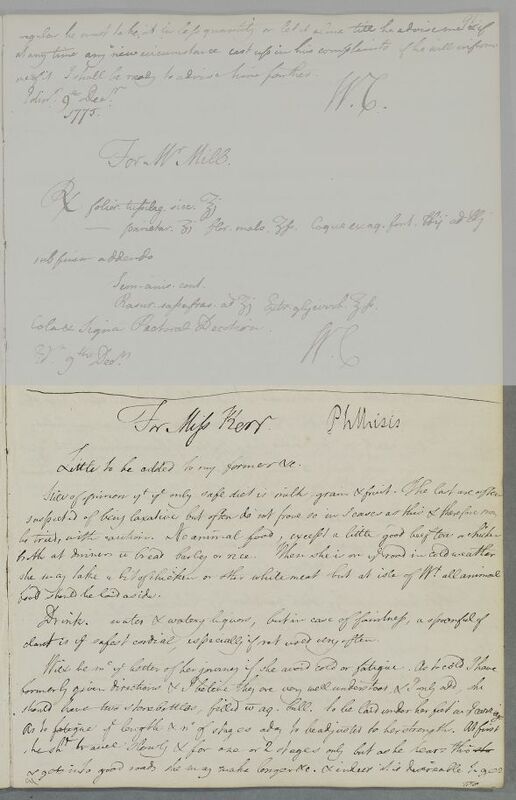 Case of Miss Kerr , who is in danger of phthisis (maybe same patient as Case 165, and 551). Little to be added to my former &c.
food should be laid aside. claret is the safest cordial, especially if not used very often. to the South as soon as conveniently can. go out in a carriage every forenoon avoiding going in frosty or wet weather. As I depend chiefly on climate diet & exercise, I shall give few medicines. less frequent may take it as seldom as she pleases & only when looseness & cough &cc. time & 2 3 or 4 times a day as her stomach &c.
Take an ounce of dried Coltsfoot leaves, a drachm of Lichwort and half a drachm of Mallow flowers. Chop, mix to make materials and of these make 20 papers. Label each paper: Materials № I. Take a drachm of Aniseed, half a drachm of grated Sassafras, and half an ounce of Liquorice extract chopped into very small pieces. Mix to make materials and label each paper: Materials № II. claret is ye safest cordial, especially if not used very often. to ye South as soon as conveniently can. go out in a carr. every forenoon avoidg. going in frosty or wet weath..
As I depend chiefly on climate diet & exercise, I shall give few meds. less freqt. may take it as seldom as she pleases & only wn loosen. & cough &cc. time & 2 3 or 4 times a day as her stom. &c.
Signa sing. chart. Materials № I.
Signa. sing. chart. Materials № II.